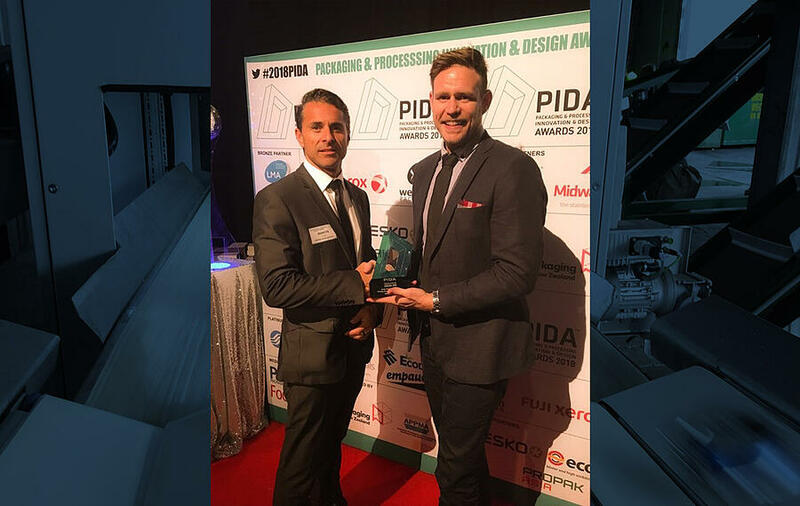 SAGE Automation has taken out the 2018 Design Innovation of the Year Award (Beverage Category, Machinery & Equipment) at the 2018 Packaging & Processing Innovation & Design Awards (PIDA). The award winning solution – a Bulk Redemption Terminal (BRT) for the automated counting and sorting of deposit legislation containers – was developed for Container Deposit Systems (CDS) to improve long held challenges experienced by the recycling depot industry under the Australian Container Deposit Legislation scheme. These challenges include long wait times for customers returning containers, theft and poor count accuracy due to manual counting and sorting methods. The BRT automatically sorts, identifies and counts container types for recycling depots. It has five skids with 26 conveyors and a central vision system camera which identifies each item and sorts them using a smart algorithm. CDS Executive Chairman Brett Duncanson said years of experience in the industry had prompted CDS to find an alternative solution. “We knew manual sorting was a pain point in the customer process and other technological solutions weren’t quite hitting the mark,” he said. Until now, technology alternatives to manual counting have also been limited; the European-made reverse vending machines on the market only accept and scan containers with intact barcodes – and one at a time. Anything slightly damaged or with no label cannot be refunded. The BRT however, automatically sorts and accepts multiple containers in any condition. Plus it sends this count data to the cloud for reporting and gives customers an instant receipt for cash refund. SAGE CEO Adrian Fahey said it was an honor to receive recognition for the project, which involved partnering with digital technology consultancy Nukon and the University of South Australia. 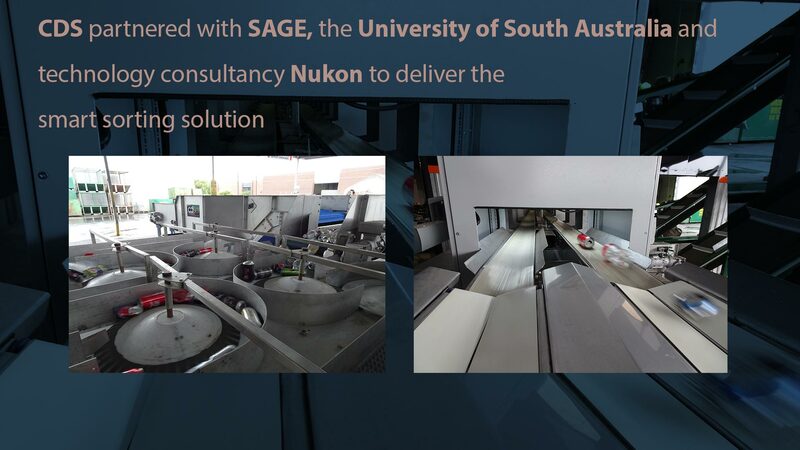 While SAGE delivered the BRT controls system, conveyor lines and vision system in partnership with UniSA, Nukon took care of the IoT-based customer-facing solutions. “What’s unique about this project,” Mr Fahey said, “is how we’ve brought the worlds of IoT, digitisation, control systems and research together to come up with something highly novel and fit-for-purpose”. “As data becomes more pertinent across manufacturing, transport, operations and business, we see this collaborative approach as the gold standard. We’re bringing together industry and researches’ best minds to deliver the best thinking,” Mr Fahey said. SAGE Automation's Clint Haggerty and technology partner NORD DriveSystem's Managing Director Martin Broglia shake hands on a job well done. The solution also harnessed a range of vendor and open source technologies. The Nukon customer-facing solution used Single-Board Computers, Amazon Web Services (AWS) and Encryption, while the SAGE control system solution used Beckhoff control and NORD DriveSystem VSDs. CDS Executive Chairman Brett Duncanson said the innovation would help the national uptake of the Container Deposit Legislation scheme. “The solution has made the returns process quicker and easier for customers, provided probity of information between members of the scheme and it proposes a viable business opportunity for container depots, both existing and new – all to decrease Australia’s landfill,” Mr Duncanson said. SAGE was also a finalist in the 2018 Sustainable Packaging Design Award for Machinery/Equipment. 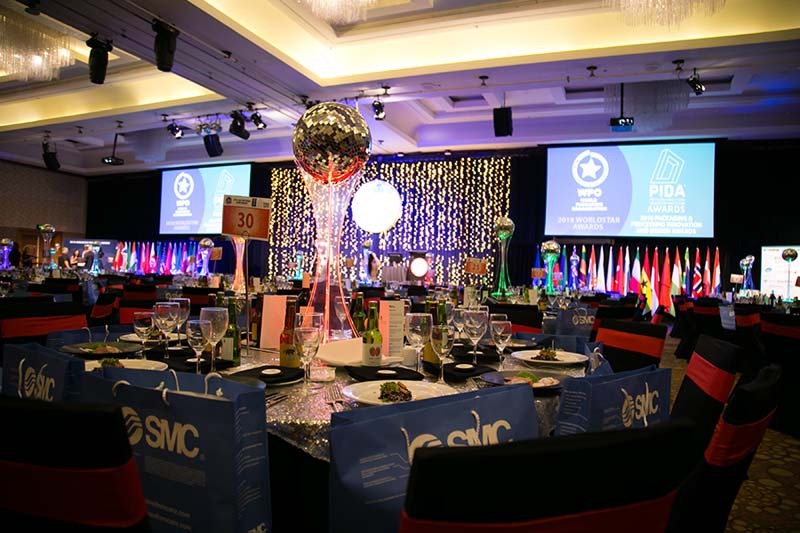 More than 500 people representing 25 countries attended the award gala at Surfer's Paradise to celebrate the world's leading packaging solutions. The gala was held in conjunction with the WorldStart Packaging Awards – putting the solution, on the world stage.